Starthere.eyemed.com is the primary site used to drive brokers and benefit buyers to for more information on EyeMed. As the web address is most commonly used on their commercial marketing materials (brochures, nurture and prospect campaigns, emails, etc. ), they wanted to revisit the site design to provide a better user experience. As a brand that touts making benefits easy, the site did not lend itself to an easy experience. There was a lot going on which made it difficult for the user to know what to focus on. GO2 was tasked with improving the user experience for starthere.eyemed.com with better design, copy and site architecture. 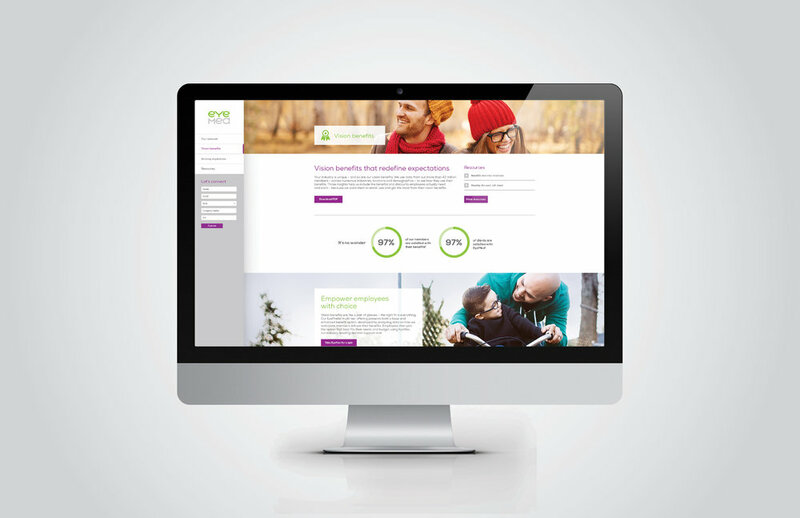 A few of EyeMed’s primary requirements were a clean, responsive design, easy user experience and the combined use of photography, iconography and simple animation. Working with a Senior Art Director and a Web Designer, I designed all five main pages for the site. Each page has a consistent layout with unique graphics and elements, making each page easy to navigate while still maintaining an exciting experience. Brand elements are incorporated throughout, including blocks of color, large lifestyle photography and EyeMed’s custom icons. Overall, the new design is a success; offering a streamlined, responsive experience and a clean, compelling design while maintaining brand standards.